Food additives are widely used on many aspects in our daily life, and have great influence on the development of the food industry. The food additives market is quite promising in Russia, and in order to have a further understanding about the local food market and explore business opportunities for the food additives suppliers and buyers, our OKCHEM Russian Team has visited Publishing House Food Industry. Founded in 1933, Publishing House has three publications, the monthly Food Industry, the quarterly Beer and Beverages and Baking of Russia. The magazine is published in the Russian-speaking countries and Eastern Europe and has a large subscriber crowd including the decision-makers, dealers, traders and manufacturers of the food ingredients, raw materials, packaging and machinery companies in the food industry. With many years of experience, the Food Industry can provide the most professional information about food additives market in Russia. In this visit, the chief editor of Food Industry, Ms. Presnyakova Olga Petrovna, met our OKCHEM team. She made a detailed introduction about the Food Industry to us including their magazine topics in 2018, cooperative partners, cooperation with exhibitions, etc. And after knowing our advantages as a platform to create values to both the suppliers and buyers in this field, Ms. Olga Petrovna showed great interests and said that she would be glad to help us get in touch with Russian food additives association and expected to reach a cooperation with us in the near future. The food additives market is booming in Russia, and many enterprises are relying on import, which means great opportunities for the food additives suppliers from China and other countries who want to export to this potential market. 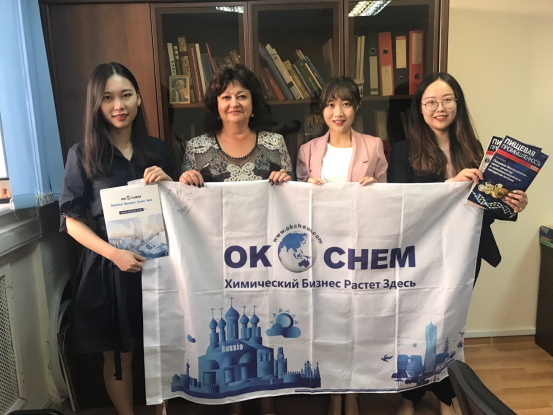 OKCHEM, as a professional platform, will connect the Russian buyers with a wide range of quality suppliers on OKCHEM and create win-win situation for both parties by helping the buyers find the best product solutions and helping the suppliers access to the Russian market.